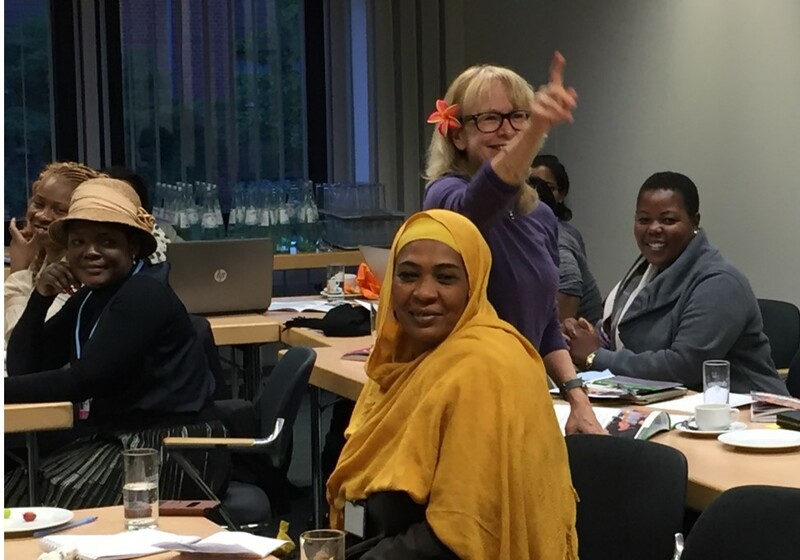 The Women Delegates Fund (WDF) supported 18 women delegates at the Bonn Climate Change Conference from April 30-May 10, 2018. These 18 women represented 8 Least Developed Countries and 10 Pacific Island nations (4 of them Least Developed Countries), with the 10 Pacific women leaders reconvening in Bonn after participating in a regional training workshop together in Suva, Fiji just weeks prior. All the WDF supported delegates are members of their national delegations, fully participating on behalf of their countries, but receive funding to facilitate their attendance at the meetings as well as opportunities to strengthen their capacity and network with other women delegates. 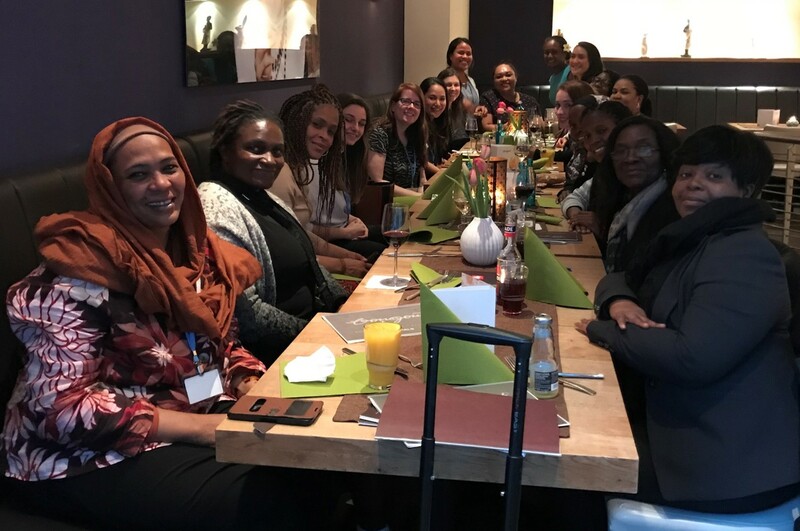 One of the WDF highlights of the conference was the networking dinner on Day 2 of the session, which included two former WDF-sponsored delegates who are now funded by their own governments because of the value they add to their national negotiation teams. One of the previous WDF delegates gave a short speech advising the newer delegates, sharing how the years-long negotiation process can be both frustrating and fulfilling, and offered herself as a resource for any future questions. One of the more experienced but current WDF delegates also spoke of the importance of mentoring and even identified a mentor for a newer delegate. This support—lifting women up along the same path trudged by other women, both practically and emotionally—is a hallmark of the WDF and the network it has cultivated over the years, and the spontaneous, explicit, and generous nature of the support offered that night was particularly special. Nearly one week later, many of the delegates were able to come together again at the WDF’s “Capacity for Change” networking reception, though this time they were joined by dozens of their colleagues, other government delegates, and advocates from civil society. This night focused on the data on women’s still-unequal participation in these climate negotiations, particularly as heads of delegations, and highlighted how capacity-building initiatives such as the WDF, working alongside the relatively new Gender Action Plan, can contribute to shifting representation so that women’s voices are brought to every UNFCCC table. For the three WDF delegates in Bonn who were the only women on their delegations, the WDF was indeed vital to ensuring women’s participation, and there is a particular pride in the five countries with WDF delegates who were indeed completely gender balanced for this session (though none of their heads of delegation were female). One of the delegates too has this very work on her agenda, as she is the UNFCCC Gender Focal Point for Chad, a new position that every Party should be appointing now that the Gender Action Plan has been adopted (though fewer than 30 have done so), while many other delegates are integrally involved with gender in their roles and follow the topic in the negotiations. Six delegates—the women representing Fiji, Kiribati, Malawi, Solomon Islands, Tonga, and Vanuatu—had been previously sponsored by the Women Delegates Fund to at least one previous negotiation session, but this intersessional was the first exposure to the international climate change negotiations for most of the participants. Despite their newness to this arena, when asked at the close of the session, most of the delegates identified leadership capacities or roles they would like to have in their future climate diplomacy work. WEDO was also pleased to support delegates from two countries that had not previously been engaged with the WDF—Chad and Papua New Guinea—increasing the number of countries from which WDF delegates have hailed since the program began in 2009 to 56.